Last Week in Review: Housing Starts surged and consumer inflation stepped up. Forecast for the Week: The final read on economic growth in 2016 will captivate audiences. View: Soup-up or strip-down your economy class airline experience. “Got the inflation blues.” B.B. King. While Housing Starts had positive news, inflationary pressures may leave some singing the blues. December Housing Starts surged 11.3 percent from November, the Commerce Department reported, beating expectations. The numbers suggest that the pullback in November, following the nine-year high in October, could have been an anomaly. While multifamily starts rebounded, single-family starts were modestly lower. 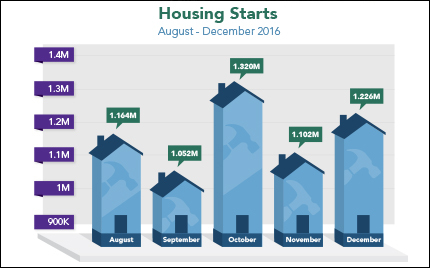 For all of 2016, average monthly Housing Starts of 1.17 million units were the best since 2007 due in part to a strong labor market and rising wages. Building Permits, which signal future construction, fell just short of expectations. On the consumer inflation front, the December Consumer Price Index (CPI) and Core CPI, which strips out volatile food and energy, were both in line with expectations. Year-over-year CPI is up 2.1 percent from December 2015. The 12-month measure marks the fastest pace of inflationary growth since the period ending June 2014. Rising inflation, at both the consumer and wholesale levels, is worrisome because it reduces the value of fixed investments like Mortgage Bonds and hurts the home loan rates tied to them. Although Bond prices have dropped in recent days, home loan rates remain at attractive levels. The final reading of fourth quarter Gross Domestic Product will close the book on economic growth in 2016. Existing Home Sales will be released on Tuesday followed by New Home Sales on Thursday. Also on Thursday, look for the usual weekly Initial Jobless Claims. On Friday, the final reading for fourth quarter 2016 Gross Domestic Product, Durable Goods Orders and the Consumer Sentiment Index will be delivered. As you can see in the chart below, Mortgage Bonds have not had a good run recently. Despite this, home loan rates are still in attractive territory. Consider new stripped-down and souped-up options in a tiered approach to economy class. Travelers don’t expect much from flying coach, except a bargain fare and a free snack. But now American Airlines, Delta and United are dividing economy class into tiers that may be more enticing than traditional coach.On the low end of the spectrum, the basic economy class of United and Delta eliminates seat selection, early boarding and the ability to change your itinerary. United’s bare-bones service even restricts your carry-on to a small, personal item, such as a shoulder bag or backpack that fits under the seat. Still, Delta’s and United’s basic economy flights are better deals than similarly priced flights on Spirit and Frontier in terms of comfort and reliability, says airline research scientist Peter Belobaba at MIT. On the upper end, American and Delta have gone plush with premium economy. Don’t confuse this level with existing upgrades, such as United Economy Plus, which usually include the first few rows of the economy-class section, with extra legroom and quicker access on and off the plane. Rather, premium economy offers a separate cabin on long-haul international routes that bridges the gap to business class, offering more room and comfier seats; amenity kits that include toiletries and other items; and finer food and drink. Should you pay more (or less) for a revised version of economy? A basic economy ticket may seem like less of a bargain once you factor in the perks you’ll lose. Premium economy seats could cost you 10% to 85% more than traditional economy, according to SeatGuru.com. If you are not sure whether it’s worth paying up, use the site’s comparison charts and the airline’s website to decide whether a wider, reclining seat and, say, an eye mask and socks are worth the price.